[Sir David Brewster, Scottish scientist and inventor.] Autograph Signature ('D Brewster') on slip of paper. 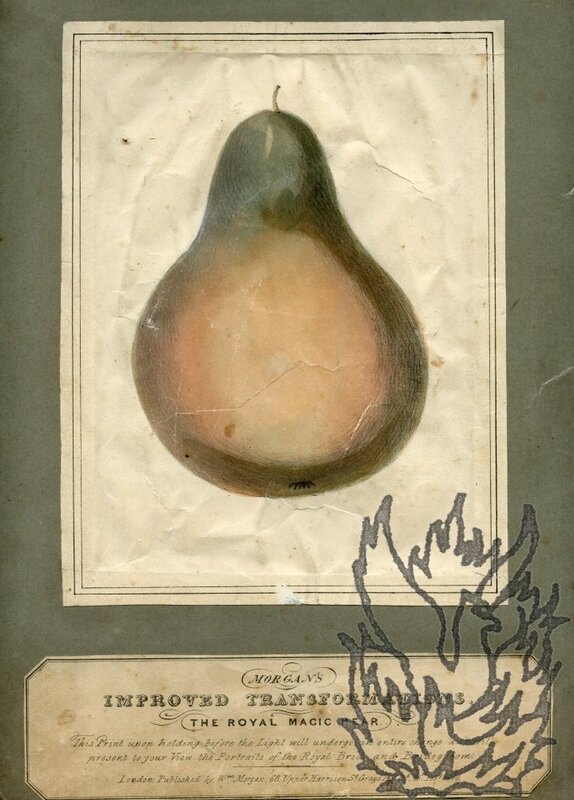 On 1.75 x 6.25 cm slip of paper, laid down on part of leaf removed from album. In fair condition, lightly aged. Simply reads 'D Brewster'. 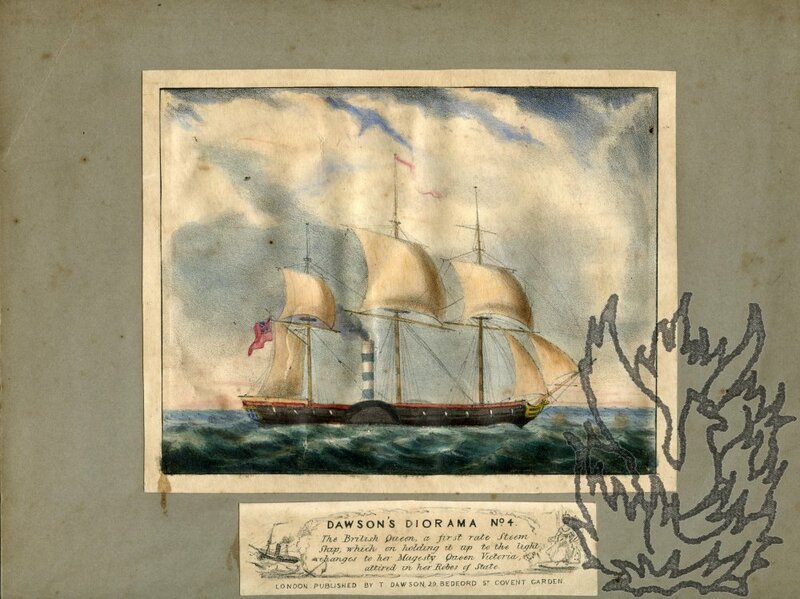 Coloured lithographic dioramic print, captioned 'Spooner's Protean Views, No. 8. St. George's Chapel Windsor Castle. In which the scene changes to the splendid ceremony of the interment of King William the Fourth'. 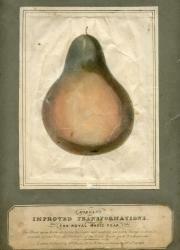 Undated [circa 1837]. 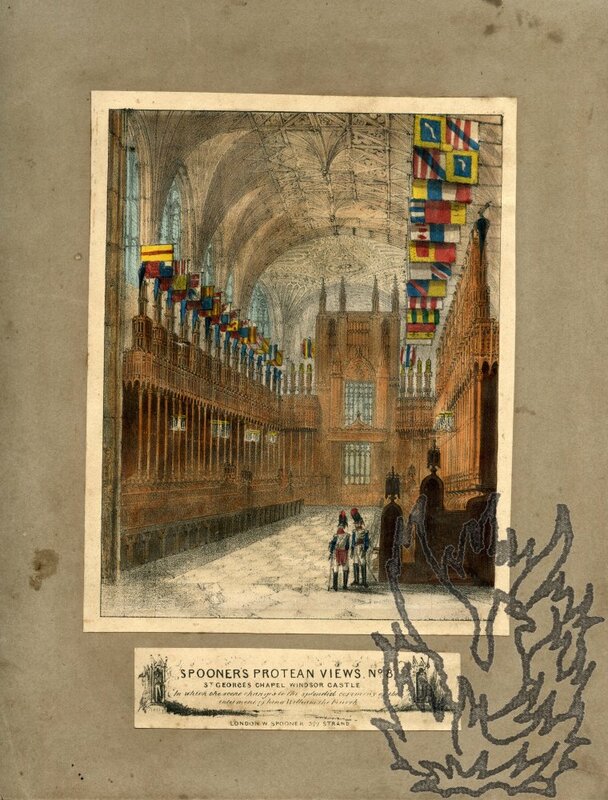 'London W. Spooner 377 Strand'. Dimensions of print roughly 17.5 x 13.5 cm. On original grey paper windowpane mount (28 x 23 cm). 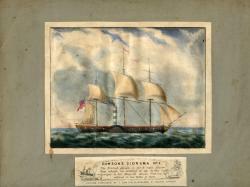 Engraved label (2.5 x 11 cm) beneath the print, with a couple of remarque-style illustrations. The print itself is good, although a little aged and spotted; the margins and mount being rather more heavily affected. Attractive and unusual item, the image changing when held up to the light. Two soldiers are shown dwarfed by the high ceiling of the chapel, which is decked with brightly-coloured flags. When held to the light the chapel is filled with the mourning congregation. Scarce. 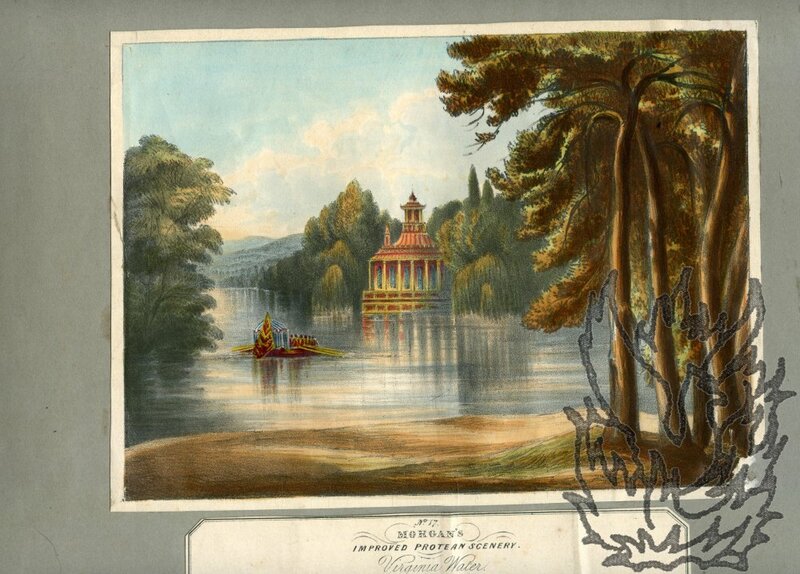 The portion of the caption, missing in the description above, reads '[...] Virginia Water. This Print at first represents this enchanting lake by day, and upon holding it before the light, you will be presented [...]'. Dimensions of print roughly 16.5 x 22.5 cm. On original grey paper windowpane mount (24.5 x 35.5 cm). Engraved label (4.5 x 18.5 cm) beneath the print. Good, bright impression, but with damage affecting an area roughly 2.5 x 2 cm in bottom right-hand corner. On lightly aged and spotted mount. Autograph Letter Signed to 'Monsieur Huot, Rue des Gravelles No. 4. Versailles'. Paris 10 aout [1830s]'; on letterhead of the Repertoire des Connaissances usuelles, Dictionnaire de la Conversation et de la Lecture. 12mo, 3 pp. Forty-four lines of text. Difficult hand. Concerns the printing of one of de Rienzi's works by Huot, to whom de Rienzi will transmit all the printed leaves which have not been published. De Rienzi's works have him fighting at Wagram and Waterloo, for the Greeks in 1818 and 1822, with Bolivar in 1819, with the Carbonari in 1821, and under Mehemet Ali in 1823. After 1830 he was a professor of Geography in Paris. He committed suicide.